Air pollution consists of a variety of harmful airborne particulates like soot, smoke, gases, chemical vapour and residue. The main sources are vehicle emissions and industrial processes. The most commonly used equipment to combat air pollution is an anti pollution mask. 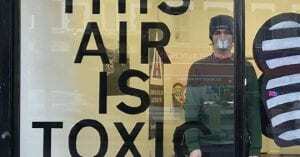 However, you shouldn’t assume that an anti pollution mask will filter out all harmful pollutants. None of the standard masks on the market were effective against pollution gases such as the nitrogen dioxide emitted from vehicle exhaust or cigarette smoke. Also there are many types on the market, so you need to be clear about how and when you intend to use your mask. Masks made and sold for a particular job in the workplace are different. They must meet rigorous standards and are normally very efficient. These controls and regulations do not apply to much cheaper masks intended for general use by the consumer. The purpose of an anti pollution mask is to filter out harmful particulates in the ambient air. Following multiple tests, it seems that tightness of fit is crucial. Facial hair prevents a good seal and the fit also depends on the shape of the wearer’s face. Then again, if the fit or seal is too tight then breathing through a mask is not easy and wearing a mask can therefore pose problems for people who have breathing difficulties or heart problems. The advice to these wearers is to wear a mask for short periods and only when you feel it is essential. Research shows that exposure to air pollution can have negative impacts on our lungs and heart. It is estimated that outdoor air pollution causes 3 million deaths each year. In two of the studies carried out in China, where facemasks are very popular, when wearing an N95 facemask while walking in the centre of Beijing, blood pressure was lower than when not wearing a facemask. In the participants with heart disease, blood flow and oxygen delivery to the heart was seen to be better when wearing the N95 facemask. In another study in Shanghai, healthy participants also had lower blood pressure when earing a facemask. These studies suggest that wearing a particle-filtering mask can reduce the short-term exposure effects on the heart and blood vessels of exposure to urban air pollution. 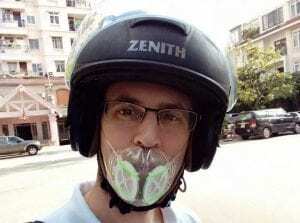 Cheap masks can prove quite efficient to filter out fine particles in a polluted city atmosphere but no so good at filtering out vehicle exhaust emissions. Common sense would lead you to buy a more expensive mask to filter out most modern day pollutants. Cloth masks are only marginally effective in protecting against harmful pollutants. Studies have shown that they only remove between 15% and 57% of particles emitted from diesel engines. They also give a false sense of security, allowing the wearer to go out in dense pollution even they are poorly protected. Masks with filters such as the N95 only work well when worn properly, which is often not the case. Of course, the best solution is not to use masks at all but to reduce pollution, but this could be a long way off. The N95 mask is generally accepted to be the most effective. It is a more advanced version of the inexpensive cloth masks. However are either not available or too expensive in many places where pollution is most severe. It is made of paper, so it can’t be washed and reused like cheap cloth face masks. Regarding the problem with poor fitting which reduces the effectiveness of a facemask, this can be solved with a mask that can be customized to fit any face, young or old. Reusability also offsets the cost. There clearly are huge health benefits to wearing an anti pollution mask but the mask must fit well, be customizable and be resusable.